Romantic comedies have always captivated audiences. Centuries have passed since actors first performed “Much Ado About Nothing” and “The Taming of the Shrew,” yet romantic comedies continue to maintain a prominent place in pop culture. Just look at the millions of dollars raked in by “Bridget Jones’s Baby” and “Trainwreck.” There seems to be something universal about the story of two people meeting and falling head over heels in love. But is our infatuation with on-screen romances distorting our view of the real thing? Many moviegoers can’t get enough of rom-com charm, but how many of these films actually reflect reality? To get a better idea of how the film industry portrays love and people’s actual experiences with it, we examined the best-selling romantic comedies for common themes. 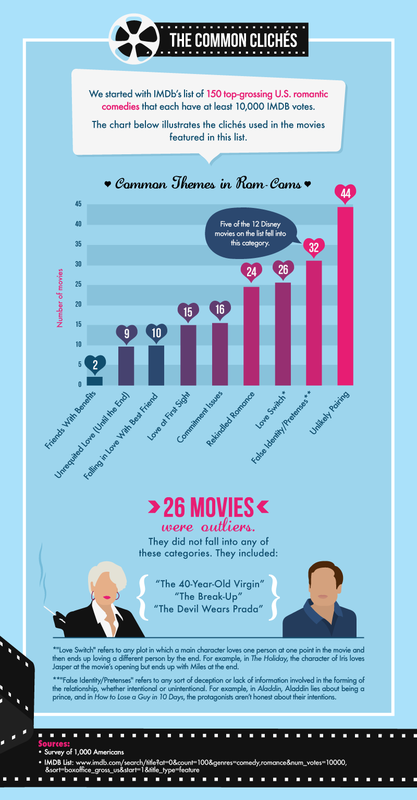 We used the top 150 grossing films from IMDB’s list of the top-grossing U.S. romantic comedies that had at least 10,000 votes. We then paired these results with a survey of 1,000 Americans who answered questions about love. So how does cinematic romance measure up to the real thing? Let’s find out. The chart above illustrates the number of times a cliché was used in the final IMDB list. By a wide margin, an “unlikely pairing” (the partners do not initially seem compatible) was the most common device used to bring new couples together, occurring 44 times in 150 films. “False identity/pretenses” was the second-most-used plot device. This means that one of the main characters is involved in a deception regarding their identity or intentions, or there is a lack of information that leads to a miscommunication. It’s worth noting that nearly half of the Disney movies on our list made use of this setup. “Aladdin” is a prime example – as the so-called character lies to Princess Jasmine about his status as a prince. Confusion and misdirection also seem to be common tactics used by filmmakers when it comes to depicting love. The third-most-common cliche was the “love switch.” This is when the main character loves one person at the beginning of a film, but ends up loving a different person by the conclusion of the movie. The “The Wedding Planner” is a textbook example of this cliché. In the movie, Mary Fiore – played by Jennifer Lopez – is an ambitious wedding planner. During the film, she is assigned the biggest wedding of her career, only to realize that she has fallen in love with the groom. Her love interest, Steve Edison – played by Matthew McConaughey – starts the film in love with his fiancée. However, as the movie progresses, he realizes that he cannot be with his fiancée. By the end of the film, he is in love with Mary. Over 100 of the 150 movies on the list use the top three cliches, all of which offer obstacles based on misdirection or misunderstandings at the beginning of a potential romantic relationship. Does this compare to how romantic partners really meet? 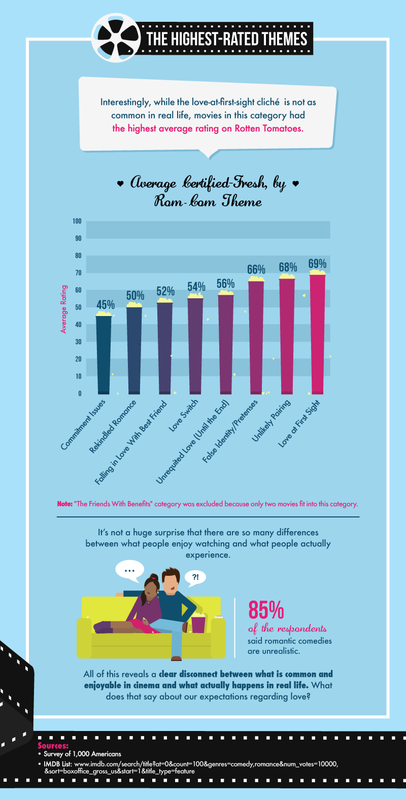 How does real love stack up for our survey respondents? It turns out, the most common cliché for our participants was actually something that most movies in our list avoided: unrequited love. In fact, 78 percent of our survey respondents said they loved someone who didn’t love them back, while the theme only occurred in 6 percent of the movies on our list. Sixty-six percent of our survey respondents also said they were in a relationship with someone they considered to be their “opposite.” The category of “unlikely pairing” accounted for nearly 30 percent of romantic comedies. However, the most glaring disconnect between movies and everyday life appeared when we looked at online dating. Only one movie touched on the subject: “You’ve Got Mail,” starring Tom Hanks and Meg Ryan. 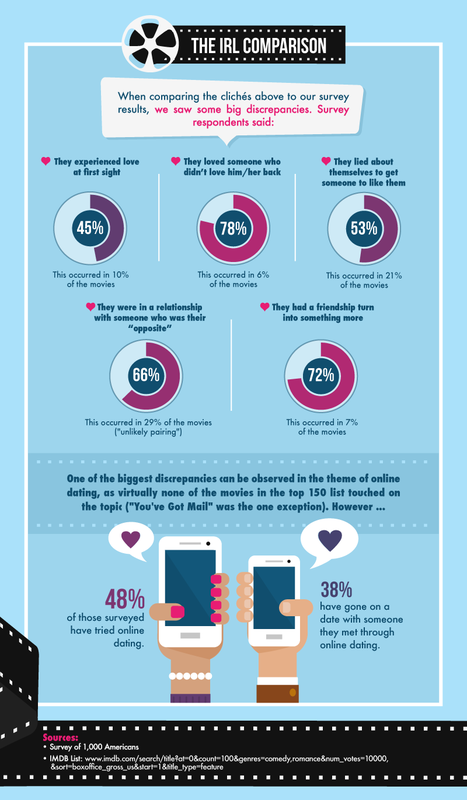 Nearly half of those surveyed said they have tried online dating, while over one-third of respondents said they have gone on a date with someone they met online. Hollywood should probably consider updating its scripts, especially since most Americans believe online dating is a good way to meet people, according to a recent study published by the Pew Research Center. There is often a disparity between what films critics admire and what audiences clamor for. While the “love at first sight” cliché was not frequently used in movies we reviewed – and not as common as other tropes in real life – movies in this category had the highest average rating on Rotten Tomatoes (69 percent). Films that focused on commitment issues had the poorest reviews, on average. Movies mean different things to different people. Some watch movies to escape from the stresses of everyday life, while others prefer to use them to challenge their own perceptions of reality and grow as people. Whatever the reason, all movies entertain. It’s not surprising then that 85 percent of survey respondents said they believed romantic comedies to be unrealistic. However, this might be the reason why movies are so appealing. Most people seem to know that love on the big screen may not necessarily match up with real life. Don’t lose heart. While love at first sight may be romantic, it’s probably not your best bet. If you are still looking for love, start online. You never know where or how you might meet someone. It’s time to get Sleepless in Sapio to discover the real-life romance you’ve been missing. We used the top 150 grossing films from IMDB’s list of the top-grossing U.S. romantic comedies that have at least 10,000 votes. We then analyzed each film, tallying the clichés that were used as plot devices. We also conducted a survey of 1,000 Americans, asking them about love. We then compared the results of the clichés seen in film versus the actual responses from people’s experiences in real life. Love the graphics that we used in this piece? Feel free to use them for noncommercial purposes only! All we ask in return is that you link back to the full page, that way, readers can see exactly what we did.